Which shows are you interested in? Our Solliner is a solar-powered 100% electric, zero emissions and zero noise catamaran. At 20′ in length, it’s a just about the same size as a Duffy. 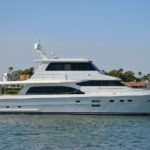 It is equipped with a Fusion marine stereo system with Bluetooth connectivity. 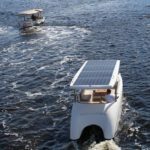 It seats a maximum of 10 passengers, and has an sun-pad on the front, dual ice boxes, a center table with 8 cupholders, led and under-hull lights, a retractable hard-top roof with 1120 W of solar panels. Depth sounder and computer screen showing time left to sail based on the level of the 4 AGM batteries, speed and the charge from the panels. For safety, it also comes with navigation lights, interior lights, horn. You’re out on your yacht, taking in the scope of the mighty Pacific…and then you look down at your old carpet. The tides change—so why not your carpet? 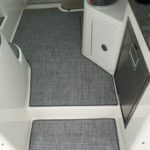 Custom Marine Carpeting delivers a first-class fit and finish to yacht owners who take pride in their vessel. For almost 40 years, CMC has kept elegance afloat in Southern California, revamping the interiors of almost every make of yacht docked in the marina. Flooring, windows, headliners, bedding, upholstery—CMC has you covered. They are the premiere supplier/installer for Infinity Luxury vinyl, Lonseal and Amtico woods, and marine blinds and shades from Oceanair and Poseidon. Stop by the CMC booth and get a thorough run-down of each product and find what’s right for your boat. Why settle for “good enough” when you can have first class? More than flooring…Contact Chester today at 949-642-2898 or cell 949-689-5311 for more information. © 2019 Newport In-Water Boat Show.